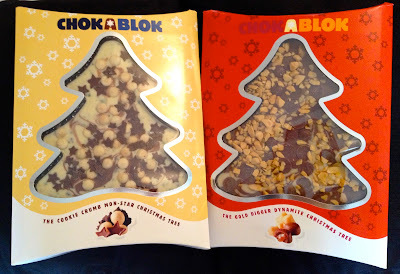 Today I want to tell you about something very special that has been released for Christmas - ChokaBlok Chocolate Christmas Trees. The Christmas trees come in four different delicious flavours. There is the the Rocky Road of Love with it's mini marshmallows and dark chocolate hearts, the Cookie Crumb Mon Star which is beautifully decorated with cookie crumbs, shortcake biscuit balls and milk chocolate stars. For the chocaholic there is the Chocolate Extremist tree which is laden with decadent pieces of brownie and milk chocolate coated malted balls, this is not one for the faint-hearted. And, for a bit of festive bling, the Gold digger Dynamite Christmas tree is festooned with caramel filled milk chocolate cups and honeycomb chunks. ChokaBlok chocolate Christmas trees really do make a very special treat for Christmas and what a fantastic surprise they would make under any Christmas tree. We were lucky enough to receive the Cookie Crumb Mon Star and Gold digger Dynamite Christmas trees to review. Ben immediately exclaimed "Wow Chocolate Christmas trees! Look stars!" when he saw them while my husbands reaction was "Yum! We don't have to wait until Christmas to eat them do we?". It is safe to say they were a huge hit with everyone and while it is hard to pick a favourite the Gold digger Dynamite won the taste test, the honeycomb chunks and caramel cups make it ever so scrumptious. These fantastic Chockablok Christmas trees cost just £4 and are available from Tesco stores, I'll definitely be getting a few for some lucky friends and family. 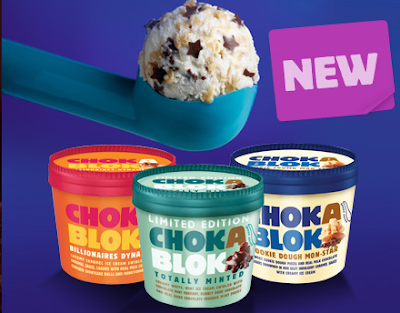 There are also some more new additions to the ChokaBlok range in time for Christmas which include ChokaBlok Ice Cream Mini Pots and an incredible ChokaBlok Ice Cream Cake. The ice cream comes in three flavours Billionaires Dynamite, Cookie Dough Mon-Star and the brand new limited edition Totally Minted while the spectacular looking Ice Cream cake, crammed with cookie dough pieces, real milk chocolate stars and cookie crumble and covered with real Belgian milk chocolate and topped with real milk chocolate stars is sure to impress and make the perfect celebration centerpiece. The ice cream mini post are priced at £1.29 and the cake costs £5 with all available now from Tesco. 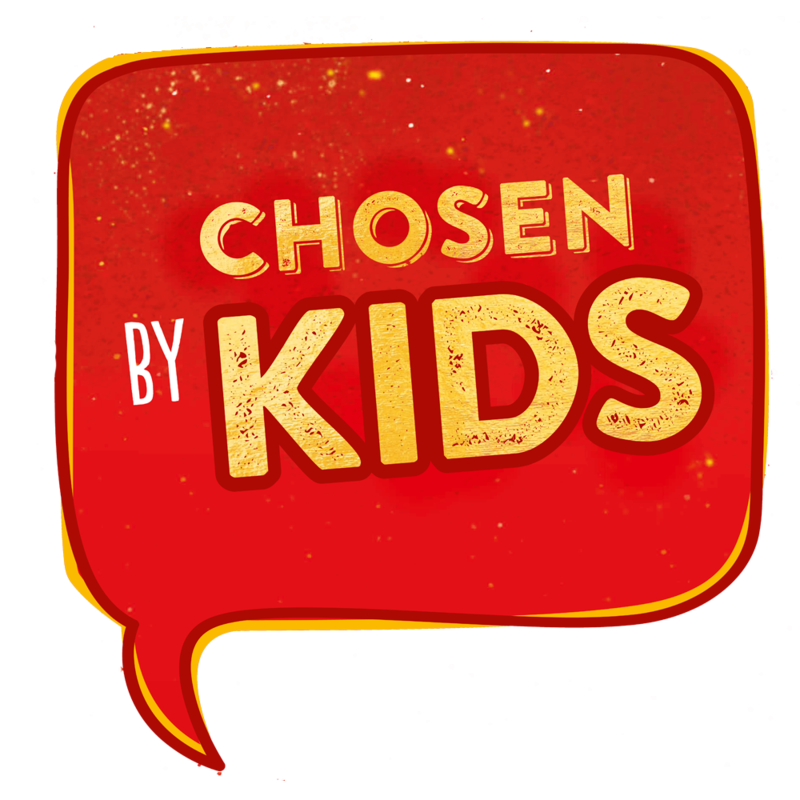 Perfect for this cold weather ChokaBlok have launched ChokaBlok Hot Chocolate Big Dippers. 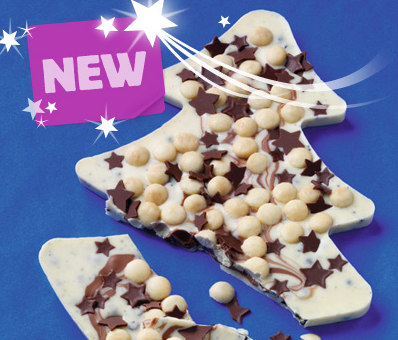 There’s Cookie Crumb Mon-Star for white chocolate lovers, chok-full of crumbly cookie pieces and hand-decorated with mini milk chocolate stars. Or Gold Digger Dynamite which is made from gloriously decadent caramel milk chocolate, hand decorated with honeycomb pieces and drizzled with creamy white chocolate. Chocolate addicts won’t find better than the Chocolate Extremist Big Dipper – a rich combination of milk and dark chocolate, loaded with crunchy pieces of chocolate brownie. 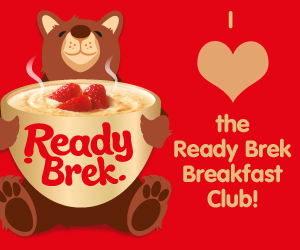 And don’t forget the classic Rocky Road - with its mini marshmallows and biscuit flavoured chocolate – it’s everything hot chocolate should be. Perfect for a cosy Christmassy night in, in front of the telly. Sound delicious don't they? These will be available exclusively at Tesco from the 12th November priced at £1.09 for individual Big Dippers and £3.69 for the ChokaBlok Big Dipper Multipack so keep an eye out for them - I know I will. *Disclaimer: I received both the Cookie Crumb Mon Star and Gold digger Dynamite Christmas trees in exchange for a review. This has in no way biased my opinion and all views expressed here are my own.